Hyalite Reservoir is located 10.5 miles up Hyalite Canyon. The reservoir was constructed in the late 1940's and enlarged in 1993. It contains cutthroat trout and arctic grayling. A 'no wake' rule has been instituted, allowing only low speed motoring for trolling. 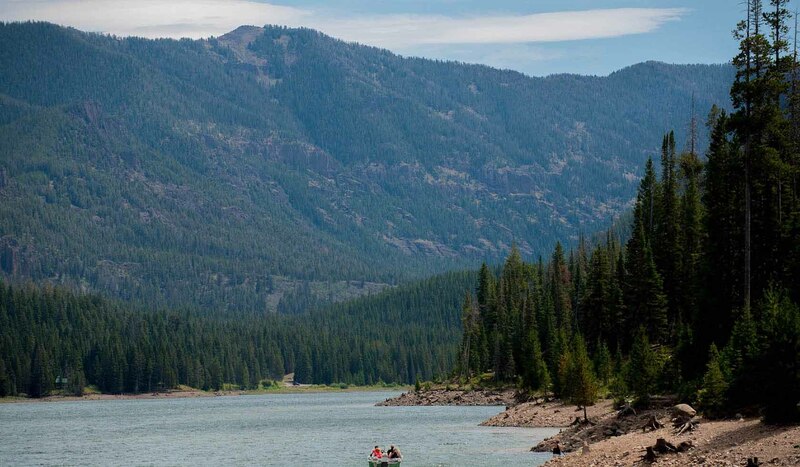 Chisholm and Hood Creek Campgrounds are located on the east shore of the lake offering family camping units, picnic sites, boat ramps, outhouses, and drinking water. Recently added was a picnic pavilion on the west shoreline of the Hyalite Reservoir Dam. The pavilion was built in collaboration with the Montana State University School of Architecture, The Gallatin National Forest and local construction professional volunteers. The structure is 20 feet by 50 feet and offers seating for 25.